The M460 harnesses the latest in GPS technology coupled with a built-in barometer to accurately track your speed, distance, route, altitude and gradient. 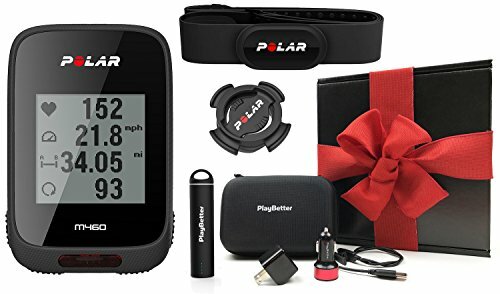 GIFT BOX INCLUDES: Polar M460 GPS Bike Computer, Polar Chest Strap Heart Rate Monitor, PlayBetter USB Portable Charger (2200mAh), PlayBetter USB Wall & Car Charging Adapters, PlayBetter Protective Hard Case, Bike Mount & USB Cable | Packed in Black Gift Box with Red Bow & Crinkle Paper! A MEMORABLE GIFT - The Polar Heart Rate Monitor, PlayBetter Portable Charger, Adapters & Protective Case are the perfect accessories for the M460 and will make this a gift your loved one will never forget! Garmin 010-N1325-13 eTrex Touch 35t Refurbished Handheld GPS, 2.6"